Information Technology - Transforming Supply Chain | Business Article | MBA Skool-Study.Learn.Share. “Information Technology doesn’t do miracles, it supports the miracle”. Yes, I am talking about the miracles in supply chain. 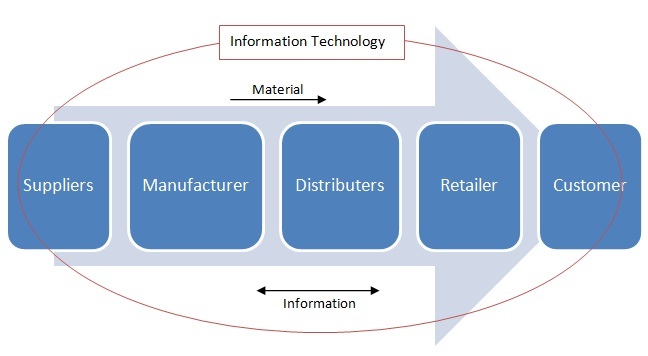 Information technology has transformed the entire supply chain, even its definition which was earlier quoted as “movement of physical material from point of origin to point of consumption” to “movement of material and information in the value chain”. This is because the companies realized that smooth information flow increases the efficiency of entire supply chain, which was absent in 1980 when paper based methods were used. Now the information is extracted, processed and stored in most efficient manner using information technology. Those who have utilized this man-made boon have reaped good gains, like Dell, Walmart, P&G etc. Supply Chain is a set of various processes – procurement of raw material, production of final good and distribution to end user. Supply chain management can be understood as management of the supply chain which includes its design, planning, execution, control and monitoring. Worlds’ best companies are using integrated information systems to gain edge over others. One such company is Dell which has scaled its business very rapidly and established itself among the top 3 PC companies in the world. Dell Inc.’s winning strategy in PC business is efficient inventory management. Major PC makers are incurring losses due to product obsolescence in fast changing electronic industry. Dell maintains thin inventory and large supplier base. Whenever customer books an order online, dell electronically shares the same details to its component providers located near to the customer. They supply the required component to nearest dell warehouses where assembling is done and final product is transported to the end user. All this is possible due to Dell’s advance IT infrastructure which enables real time information sharing with suppliers. Dell has strong base of 5000 suppliers worldwide. This enabled Dell to offer maximum customization benefit to its customer. Walmart is world’s largest retailer and with more than 8,500 stores in 15 countries. P&G and Walmart entered into strategic alliance in which P&G maintains its products’ inventory in Walmart stores. Walmart shares the P&G products’ point of sales data to the company and it replenishes the inventory whenever reorder point is reached. This reduces part of supply chain burden from Walmart and helps P&G in optimally track the demand which resulted in good availability of the product. Emergence of Information technology not only benefitted manufacturing firms but also service industries. Logistics, Banking and Trade exchanges, etc. are amongst the biggest beneficiaries of Information technology. In banks, millions of transactions are done by its’ customers everyday. IT enabled electronic systems transfer money instantaneously which reduced the transfer of currency notes to a much greater extent. Information can be aggregated at all levels without the any transfer of papers between the bank offices. The end user also appreciated the convenience to access banking services on remote computers and mobiles. Today IT is inseparable part of bank’s supply chain. Trade exchanges are able to bring down the trading cost due to electronic transfer of shares using ‘demat’ account. Logistics is the most critical and most outsourced part of the supply chain of the company. Currently most of the major companies are outsourcing logistics to 3PL provider to optimize their operations. Many big 3PL players like TNT, FedEx and DHL operate worldwide and provide domestic and cross country logistics services. These 3PL extensively use IT in their operation for package routing and tracking. It increases the operational efficiency when company operates at large scale. 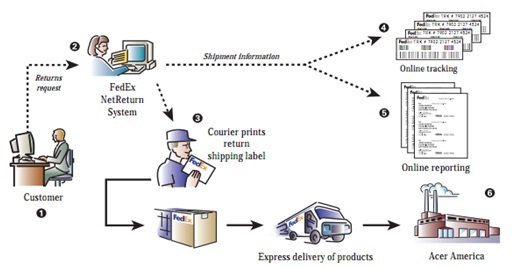 Above figure shows the use of Information technology in FedEx. FedEx is the third party logistics provider for Acer. When a customer logs a complaint about the malfunction of Acer’s product, FedEx database also gets updated. FedEx collects the package and ship it through its network to Acer’s repair center. FedEx attach barcode on the package and the corresponding information is updated in its database. The package is tracked throughout its pre-delivery point by barcode reader at each intermediate warehouse of FedEx. Package carrying vehicle is also tracked on real time basis through GPS. This greatly helps the customer and Acer in indentifying the exact location of the package. Information technology has not only benefitted the big companies but many smaller companies also embraced its benefit. E-commerce has played a game changing role in supply chain operations. Now companies can source the required raw material at competitive price using E-procurement. It reduces the total procurement cost. It serves sellers to get better price and more customers. Also many governments like USA, Singapore, India, Australia, etc. are using E-procurement. Small companies are using websites and online social networking websites to sell their products. Through this they have significantly reduced the cost of physical distribution network. It also eliminated the retailer’s margin hence improved profitability. Many such companies are Mayantra, Snap deal, yebhi.com, book mantra, etc. and more are coming every year. Information technology now affects every process of supply chain. Following tables shows the various IT applications for Supply chain operations and their importance. Information technology is dissolving the information flow barriers between various supply chain entities and helps the members to create net value in the system by minimizing the demand uncertainty. IT is an effective tool to suppress bullwhip effect due to poor forecasting. World is shrinking due to globalization and needs equivalent proximity in the physical world. Information technology led Supply chain is doing the task of fast, defect-free and accurate delivery of goods worldwide. In India, distribution network is very segregated and poorly managed but if future it can see more organized structure due to increasing IT penetration in the country. I would like to reiterate the opening statement that ‘Information Technology doesn’t do miracles, it supports the miracle’. It’s the strategic tie-ups of Dell Inc. with its supplier which helps it keeping very low inventory, IT tools only facilitated this collaboration in effective way. Same is in the case of Toyota where close operational and financial alliances with supplier helped it adopting lean manufacturing. IT infrastructure only helped Toyota and its suppliers to track the demand and supply. Companies should strategically think of their competitive advantage in the design of their supply chain and power it with the large pool of tools available in the Information technology’s basket. Logistics Quarterly, Official Magazine of The Logistics Institute, September 2007. This article has been authored by Nishant Maheshwari from IMT Ghaziabad.